I finished this quilt over the weekend. I am quite happy with how it came out and I am already envisioning an adult-sized "plus" quilt to make someday. I have gravitated towards using reds in my quilts quite a bit within the past year. Fabrics I used include Daiwabo Tiny Tip Top, Meet the Gang, Sherbet Pips, Lizzy House Pearl Bracelet, Momo Half Moon Modern, and Tufted Tweets. I backed the quilt in red minkee. It was not an easy process to put a real binding on the whole thing - that was my least favorite part of the whole process. I am going to try a different method with the girly quilt and maybe do a tutorial - there isn't a lot out there online on how to back a quilt with the minkee-like fabrics. I really didn't have a lot of black and white fabrics to use for this - while I don't use a lot of black in my quilts - this did make me realize that it could be good to have a few more options in my stash. I did straight line quilting on the quilt- I definitely didn't want to do a bunch of busy free motion stitching that would take away from the graphic appeal of the fabrics I had chosen. I am really closing in on completing all of my baby projects. I am dying to cut into some fabric stacks I have been playing with and start a quilt (or two). I am not going to deny that even though I am SO ready for this baby to come - I still get nervous about the transition to a family of four and the unavoidable depletion of my sewing time. I completed a reversible car seat cover. I skimmed a few online tutorials but didn't feel the need to follow any of them very closely - it's just a rectangle with velcro straps. I added a layer of flannel between the quilting cottons to give it some weight and perhaps aid in a future use as a playmat. I like this side the best - the blood orange color on the tree blossoms is gorgeous and the Park Slope leaf dot couldn't match it any better. I may have made this on the bigger side - but what else is new? The fabrics don't really match the apple green of the car sear - but it doesn't bother me. This Heirloom print is probably one of my most favorite fabrics - it's so graphic and appeals to my penchant for monochromatic prints. 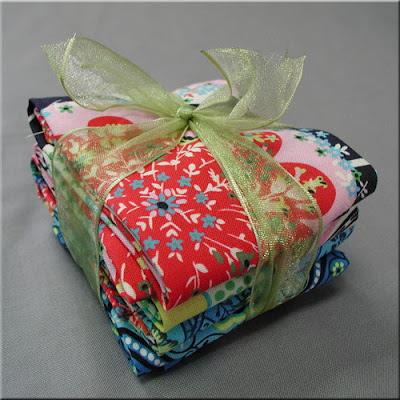 Thanks to all those who entered the Quilter's Way giveaway. The random number generator chose #3: Rosa - who said she loves "Ruby." The most popular response for everyone's favorite collection from 2011 was Windham's Echo. My son finally graced us with two uninterrupted nights of sleep over the weekend, so I finally found some energy to work on a few projects. Here they are on my design wall: The plus quilt was a dream to make - one evening of cutting and arranging, another evening to put it together. It was so quick and I love the way it looks. My only regret is adding that "Swell" bird print - I realized too late that it is very "off white" while my other white prints are very bright. To the side of the plus quilt is a quick beginning of a table topper I needed to make in preparation for the weekend's BMQG meeting. Unfortunately, we had to cancel the meeting due to the snowstorm on Saturday. I also started a diaper bag that I hope to finish today. "Nesting" via sewing projects is a lot of fun. Thanks to Quilter's Way for allowing me to participate in their Kit Designer blog tour. In case you were unaware, some of my friends from the BMQG have participated in this event earlier in the week: Alice, Jen, Aimee, and Pippa. We were all asked to review a new tool on the Quilter's Way website, Kit Designer, which allows you to design a custom quilt kit using templates and images of fabric from the shop's inventory. I was immediately drawn to the Snow Stacks pattern and had fun adding fabrics from Lark, Modernology, Taza, Children at Play, Mod, and Kona and Designer Solids. You all know that I am trying to branch out from creating quilts solely out of one collection - so this is a great way to see how a bunch of prints work together that are not normally grouped together. I have to say that I was impressed with the ease of the Kit Designer. I have had more trouble figuring out how to use a gift card code online than I did in designing a twin-sized quilt with this online tool. The only real trouble I had was in trying to figure out how to embed the image of what I had created into this blog post - but the link is here. I am not the most computer literate person, so I don't blame the QW software for my confusion! I am pleased to host a Quilter's Way sponsored giveaway: four fat quarters of Amy Butler's Lark collection. I wasn't too sure if I liked Lark when I saw previews of it last year - but I can honestly say that it is one of my most favorite collections from 2011. To enter the giveaway, please leave a comment on this post and tell me what your favorite collection is from 2011. International entries are welcome, no-reply blogger comments will be deleted. A winner will be chosen randomly on January 23. Good luck! The popularity of solids gained momentum this past year. Robert Kaufman Kona Cotton solids have some serious competition now - finding the perfect shade of blue, for example, has never been so easy. The rise in cotton costs this year has resulted in solids being priced the same or almost the same as designer prints - a fact I find very annoying. Speaking of the rising cost of cotton, I have also noticed that the popularity of different fabric substrates (voile, velveteen, sateen, etc.) are cropping up everywhere. I am amazed that some people are more than happy $20 per yard for special Japanese imports, organic fabrics, etc. A lot of these special designs have very clever, unique, and beautiful designs and I think people are willing to overlook the high cost because of this. I have loved renting time on a long-arm quilting machine. I truly enjoy it! I also wore holes into the fingers of these machine quilting gloves on my home machine - couldn't do FMQ without them! What did you make that your most proud of? The king size quilt, "My African Heart," is quite an accomplishment for me. It was inspired by Sarah Fielke's design (seen on the cover of her first book) but I really feel a lot of ownership of the design and concept despite borrowing the idea. The quilt reminds me of a special/crazy time in my life and I am glad to have such a momento of my four months volunteering in Uganda. The Hexy MF quilt from I'm a Ginger Monkey is simply breathtaking and may make me commit to a better plan for a large hexie quilt. There have been a lot of scrappy rainbow quilts that I love too. Finally, I am smitten with this WIP from Lucy and Norman: Maple Leaf. Do you have a favorite sewing book or pattern from last year to recommend? I really like Quilting From Little Things and Modern Log Cabin Quilting. Are there any trends your're over and done with? Cheesy motifs for boy fabrics including pirates, robots, skulls, forest animals, etc. It's just a personal thing but I probably won't ever do a bee for exchanging blocks again. Again, it's a personal thing - but I am going to try to shy away from precuts and making quilts solely out of one collection - I prefer a more eclectic look. I barely joined Pinterest and I am finding that I enjoy organizing my links that used to clog up my "favorites" bar. I will admit to spending more time on facebook this year and I guess I am more of a "lurker" than a "poster." I don't even know what Twitter is. Instead of spending lots of time on social media, I tend to use my computer time reading others blogs. Do you have a favorite fabric collection or print from 2011? Anna Maria Horner's Loulouthi is awesome. I have yet to touch the pieces I own - but I already want more. The best print that I want to make curtains out of is this one. I don't own any, but the Loulouthi voiles and velveteens are gorgeous too. and I think my favorite print is this one. Oh! I am also in love with Denyse Schmidt's Joann's collection Daisy Mae. I have a big stack that coordinates with some African fabric that I can't wait to dive into. What do you predict for the sewing industry in 2012? More owls - even though everyone is tired of them. More fabric designers being "discovered" via avenues like Spoonflower. More reprints of old favorites - I have heard rumors of Amy Butler and Anna Maria Horner doing this eventually. What are my goals for 2012? Any big or life changing projects? I am trying to be realistic about what I can accomplish in 2012 with a new baby coming at the end of February. I would love to devote more time to smaller projects - specifically items to decorate/use in my home. I am also PSYCHED that the BMQG has been invited to display quilts in a gallery during the Lowell Quilt Festival- this is huge for our group! I decided to make one of Gregory's friends a quilt last week. The little boy is obsessed with all things cars, so this Anne Kelle fabric from her Ready, Set, Go! fabric was perfect. I followed the same design concept I completed over a year ago for Gregory's whale blanket. I used Elizabeth Hartman's pattern. This quilt was a quick project - it only took me about 3 days. I used Kona solids from my stash. I couldn't resist including this goofy picture of my husband who also doubles as my resident "quilt holder." This quilt is the first finish of 2012. After finishing a gift for a friend's son (will post as soon as I get the chance to take a picture) - I can finally focus on sewing for my baby that is due in 8 weeks. We didn't find out the gender - so I am planning to make a girl quilt and a boy quilt. Here is my first attempt at doing a girly quilt. It is a shameless imitation of this lovely quilt from the blog A Quilt Is Nice. Finding 47 unique character prints in my stash was a bit of a challenge! But I think I did okay. My two favorites are the frogs playing holding hands and the 7 dwarfs surrounding Snow White. I am concerned that this quilt top came out too big and I am unsure if I want to commit to having this quilt be the first quilt for the (potential?) daughter I may be carrying. I really want to start out with a small quilt, backed in something soft, that the baby might attach to.... I am going to have to think on this and I am already planning a second girl option. The ironic thing is that I think I might be having a boy - the only reason why I started on the girl quilt first is because it is easier than the plan I have for a boy quilt and I felt like doing something quick and easy.